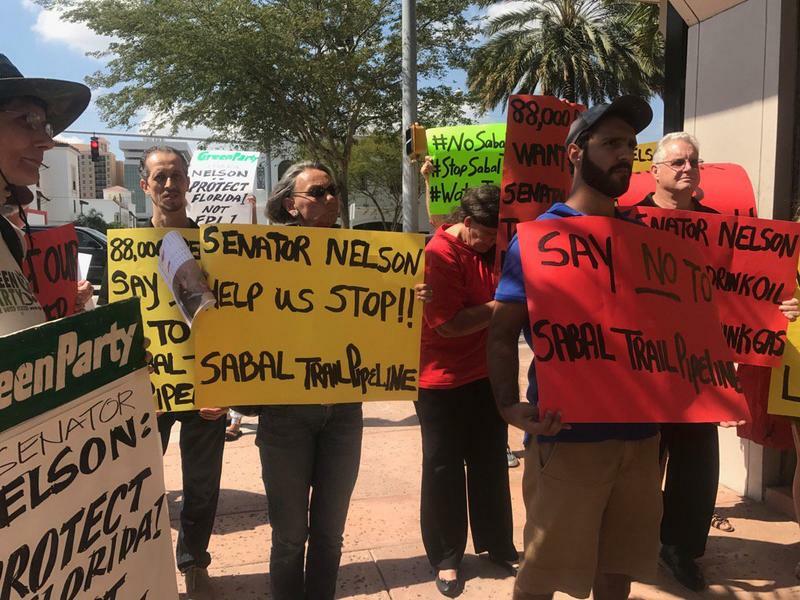 Protesters outside Sen. Bill Nelson's office in Coral Gables on Tuesday demanded a response to their petition against the Sabal Trail Pipeline. In 2014, Nelson was one of the deciding votes against the Keystone XL Pipeline that would have run from Canada to Nebraska. "We know he's against pipelines," said Deborah Dion, one of the protest organizers, "but he's been silent on this issue." "He's getting campaign contributions from Florida Power and Light and their parent company," Dion continued. "We think that's why he's being silent." Nelson's campaigns have received $73,250 from Florida Power and Light's parent company, NextEra Energy, over the course of his career. That's according to the Center for Responsive Politics, a non-profit, non-partisan group that tracks campaign contributions. Data was not immediately available for campaign contributions from Florida Power and Light itself, nor from Duke Energy of Florida. 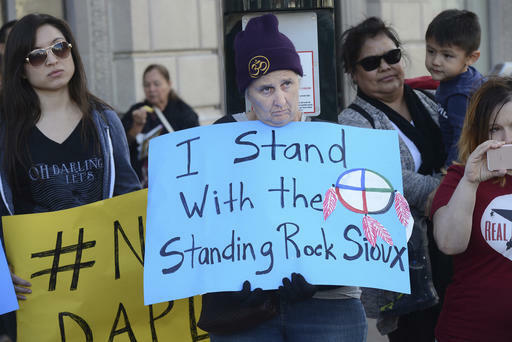 Both companies stand to benefit from the pipeline, according to the website of the company overseeing the project. That company, Sabal Trail Transmission, is a joint venture among NextEra Energy, Duke Energy and Spectra Energy Partners. The pipeline project will "increase energy diversity, security and reliability to these Southeast markets," according to the Sabal Trail Transmission website. The website says a study by the economic consulting firm Fishkind & Associates shows pipeline construction in Florida will create about 2,709 jobs and generate hundreds of millions of dollars in economic activity. Protester Gloria Pierce says she’s concerned about chemical leaks from the pipeline. "The water that gets damaged because of these chemicals... it’s going to flow down," she said. "The fact that I'm around here, in Miami, doesn't matter. It's going to affect all of us whether it's up north or down here in the south." Nelson was not at his Coral Gables office on Tuesday afternoon. But a staff assistant told protesters Nelson did receive the petition and letter delivered late last year. The protesters then asked to set up a meeting with the senator and the assistant gave them contact information for his staff. Another protest against the Sabal Trail Pipeline is scheduled for 2 p.m. Saturday at Wayne Huizenga Park in Fort Lauderdale. 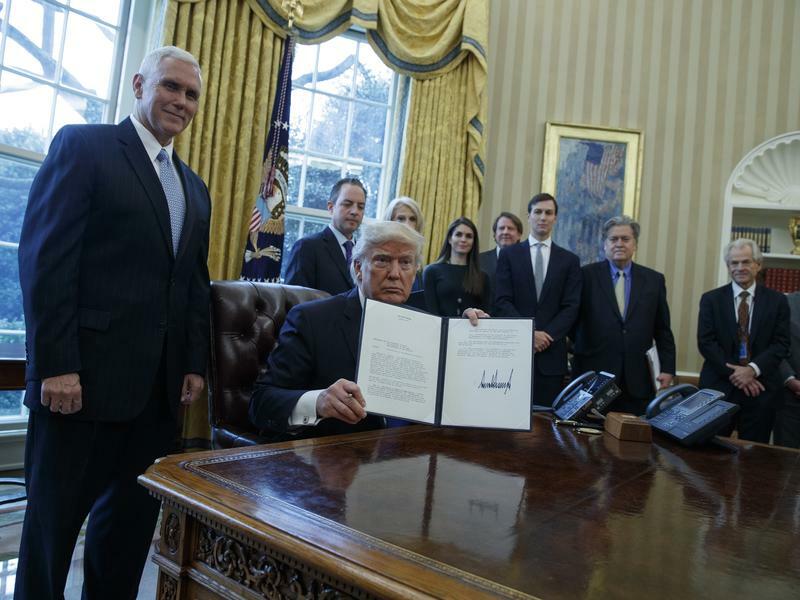 The Trump administration is pushing forward with plans for two major oil pipelines in the U.S., projects that sparked nationwide demonstrations and legal fights under President Barack Obama.